Display backlight will not shut off! I received a similar question about the display via email from someone else, and, in response, I tested various scenarios as listed below. Let me start by going over the main display when the phone is flipped open. 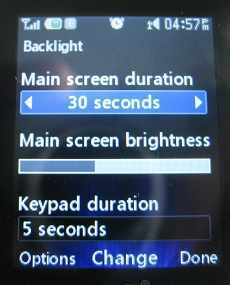 where you can set the duration of the backlight from 5 seconds all the way up to two minutes. You can even turn the backlight "off" in which case it stays in dim mode only when the phone is flipped open. You can also adjust the level of the main screen brightness if you want to try and save the battery even more. These timings apply to when the phone is flipped open. When you close the flip phone, I checked (by keeping the phone open just enough to see the main screen) that the display turns off in about three seconds. For the external display I checked various situations to see if it turned off. I went ahead and set a wake-up alarm on my phone. After setting the alarm, the external display continued to work normally. It stayed bright for about 3 seconds, went dim for another two seconds before going completely dark. side buttons to turn it off), the screen went through the same bright, dim and then off cycle. I also had both a daily alarm and well as a calendar event with an alarm set and again the external screen behaved normally. This behavior is fixed and I looked all over the phone settings and couldn't find a place to configure the external screen settings. So if either of your phone's displays does not shut off, it does seem like a defect and may be covered by the warranty in Tracfone's Terms and Conditions. My only suggestion would be to contact Tracfone again and explain the problem to them. Comments for Display backlight will not shut off! Just got the LG 420g and had the same problem. In my case it's a known (found it on another forum) problem related to the alarm being used. I can avoid it by using the volume button on the side to silence the alarm or by opening and closing the lid. Pressing "snooze" or "stop" on the screen results in the lights staying on, which you can resolve by turning the phone off and on again. If you need to use the snooze on an alarm, you can use the methods above to silence the alarm as many times as you need to, then go through the Menu (Tools - Alarm Clock) and turn the alarm to Off. See Post #4 including the link to another thread with even more details. The backlight on the outside display of my LG would go to the dim level and not turn off, and would run my battery down. I tried everything and finally just rebooted by turning it off and back on again. That fixed it.